The Vaudeville Theatre is a London West End theatre on The Strand in the City of Westminster. As the name suggests, the theatre held mostly vaudeville shows and musical revues in its early days. It opened in 1870 and was rebuilt twice, although each new building retained elements of the previous structure. The current building opened in 1926, and the capacity is now 690 seats. Rare thunder drum and lightning sheets, together with other early stage mechanisms survive to this day in the theatre. The theatre was designed by prolific architect C. J. Phipps, decorated in a Romanesque style by George Gordon, and opened on April 16, 1870 with Andrew Halliday's comedy, For Love Or Money and a burlesque, Don Carlos or the Infante in Arms. A notable innovation was the concealed footlights, which would shut off if the glass in front of them was broken. The owner, William Wybrow Robertson, had run a failing billiard hall on the site but saw more opportunity in theatre. He leased the new theatre to three actors, Thomas Thorne, David James, and H. J. Montague. The original theatre stood behind two houses on the Strand, and the entrance was through a labyrinth of small corridors. It had a seating capacity of 1,046, rising in a horseshoe, over a pit and three galleries. The cramped site meant that facilities front and backstage were limited. The great Shakespearean actor, Henry Irving, had his first conspicuous success as Digby Grant in James Albery's Two Roses at the theatre in 1870, which held the theatre for what was at the time an extroardinarily successful run of 300 nights. The first theatre piece in the world to achieve 500 consecutive performances was the comedy Our Boys by H. J. Byron, which started its run at the Vaudeville Theatre in 1875. The production went on to surpass the 1,000 performance mark. This was such a rare event that London bus conductors approaching the theatre stop shouted "Our Boys!" instead of the name of the theatre. Dramatist W. S. Gilbert presented one of his later plays here, Rosencrantz and Guildenstern, a burlesque "in Three Short 'Tableaux'" in 1891 (although he had published it in 1874 in Fun magazine). Also that year, Elizabeth Robins and Marion Lea directed and starred in Ibsen's Hedda Gabler at the theatre, and his Rosmersholm had its London premiere here. In 1882, Thomas Thorne became the sole lessee, and in 1889 he demolished the houses to create a foyer block in the Adamesque style, behind a Portland Stone facade on the Strand. Once again, the architect was C. J. Phipps. The theatre was refurbished to have more spacious seating and an ornate ceiling. It reopened on January 13, 1891 with a performance of Jerome K. Jerome's comedy, Woodbarrow Farm, preceded by Herbert Keith's one-act play The Note of Hand. This foyer is preserved today, as is the four storey frontage. In 1892, Thorne passed the lease to restaurateurs Agostino and Stefano Gatti, who were also the owners of the lease of the nearby Adelphi Theatre, since 1878. The first production at the new theatre was a revival of Our Boys. The lease briefly passed into the hands of Weedon Grossmith in 1894, but was back with the Gattis in 1896. The theatre became known for a series of successful musical comedies. The French Maid, by Basil Hood, with music by Walter Slaughter, first played in London at Terry's Theatre under the management of W. H. Griffiths beginning in 1897 but transferred to the Vaudeville Theatre in early 1898, running for a very successful total of 480 London performances. The piece starred Louie Pounds. Seymour Hicks and his wife Ellaline Terriss starred in a series of Christmas entertainments here, including their popular Bluebell in Fairyland (1901). Sadly, the foyer of the theatre had become infamous as the site of an argument in 1897 between Richard Archer Prince and Terriss's father, actor William Terriss. Soon after that argument, the deranged Prince stabbed William Terriss to death at the stage door of the Adelphi Theatre in Maiden Lane. Prince was a struggling young actor whom Terriss had tried to help. The theatre closed on November 7, 1925 when the interior was completely reconstructed to designs by Robert Atkins. The auditorium was changed from a horseshoe shape to the current rectangle shape, and the seating capacity reduced to just over 700. A new dressing room block with an ornate boardroom extended the site to Maiden Lane. The theatre reopened on February 23, 1926 with a popular revue by Archie de Bear called R.S.V.P., notable because its final rehearsal was broadcast by the BBC. The theatre then hosted William Somerset Maugham's comedy, The Bread-Winner in 1930. After World War II, the theatre prestented William Douglas Home's play, The Chiltern Hundreds, which ran for 651 performances. The record-setting musical Salad Days, composed by Julian Slade with lyrics by Dorothy Reynolds and Slade, premiered at the Bristol Old Vic in 1954 but soon transferred to the Vaudeville, enjoying the longest run of any theatrical work up to that point in history. Another notable production at the theatre was Arnold Wesker's 1959 play, Chips with Everything. A proposed redevelopment of Covent Garden by the GLC in 1968 saw the theatre under threat, together with the nearby Adelphi, Garrick, Lyceum and Duchess theatres. An active campaign by Equity, the Musicians' Union, and theatre owners under the auspices of the Save London Theatres Campaign led to the abandonment of the scheme. Brigid Brophy's The Burglar premiered at the theatre in 1967, and Joyce Rayburn's comedy, The Man Most Likely To..., starring Leslie Phillips, opened initially at the Vaudeville Theatre in 1968 and went on to run for over 1,000 performances in London. In 1969, the Gatti family sold their interest in the theatre to Sir Peter Saunders, and in 1970 he commissioned Peter Rice to redesign the interior. Among other changes were a deep red wallpaper in the auditorium and more comfortable seats. Also, the loggia above the street was glazed to make the balcony an extension of the bar. The backstage lighting was rerigged, and a forestage lift and counterweight flying system were installed. The theatre achieved some protection in 1972 when it was Grade II listed. In 1983, ownership passed to Michael Codron and David Sutton. Stephen Waley-Cohen took ownership in 1996, passing it to Max Weitzenhofer in 2002. A 1996 revival of Salad Days, starring the duo Kit and The Widow, was not successful, but Jean Fergusson's show She Knows You Know!, in which she portrayed the comedienne Hylda Baker, played at the theatre in 1997 and was nominated for a 1998 Laurence Olivier Award for Best Entertainment. Showtune, a musical revue celebrating the words and music of composer Jerry Herman was given a London production at the Vaudeville in 1998 under its previous title The Best of Times. That same year the theatre housed Kat and the Kings, which won the Olivier for Best New Musical and, in an unusual move, Best Actor in a Musical for its entire cast. Madame Melville, a play by Richard Nelson was presented in 2000. It marked the return of Macaulay Culkin to acting after a six year hiatus and also starred Irene Jacob and Madeleine Potter. In 2001 Ray Cooney's farce Caught in the Net, starring Russ Abbott and Eric Sykes, had a ten-month run. The dance/performance art troupe Stomp was in residence at the theatre from 2002 to 2007. Since 2003, the theatre has been owned by Max Weitzenhoffer, and in 2005, the venue was brought under the management of Nimax Theatres Limited. Age Restrictions: Children under 16 will not be admitted. 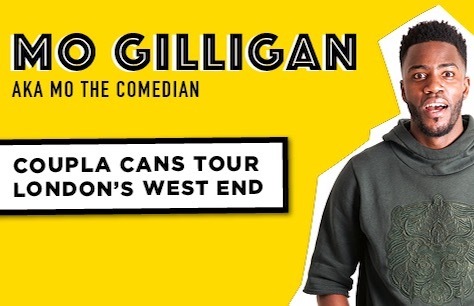 Mo Gilligan brings his smash hit Coupla Cans Tour to the West End! After totally selling out the first and second leg of his smash hit Coupla Cans Tour in a matter of minutes, stand up sensation Mo Gilligan is adding a string of new shows for 2018 by massive, record breaking demand! With his high-energy style and stunning physicality, Mo is one of the UK’s fastest rising comedy stars with an online reach running into multiple millions. His sketches regularly go viral, trend and are co-signed by some of the most famous names in international music including Drake and Stormzy. He has already made huge wave making appearances on The Russell Howard Howard (Sky One), The Chris Ramsay Show, Live from the Comedy Store and Rob Delaney’s Stand Up Central (Comedy Central) and this summer will Co Host The Big Narstie Show for Channel. He is also currently filming his own big comedy entertainment pilot Mo’s Town for the channel. Combining music with perfectly pitched observational comedy, Mo Gilligan is fast becoming a voice of his generation, perfectly representing the very modern future of British comedy.